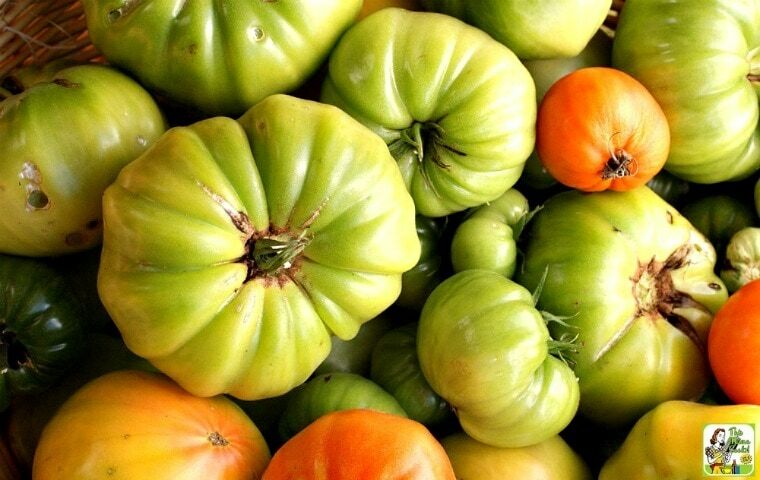 Overwhelmed with tomatoes from your garden – and tired of making tomato sauce and salads? 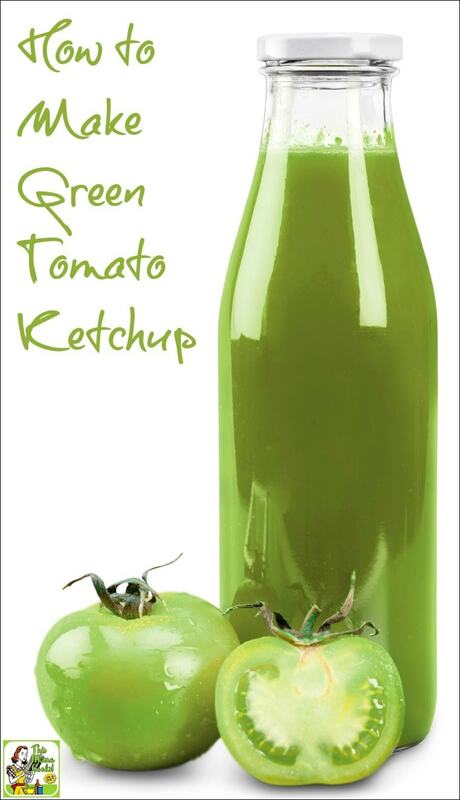 Then it’s time to make this easy Green Tomato Ketchup recipe! Even if you’ve never canned tomatoes before, you should try making this Green Tomato Ketchup Canning recipe. It’s not as hard as you think! After all, there’s nothing like enjoying the benefits of your garden year round by canning your tomatoes. Since I was new to canning tomatoes, I decided to make green ketchup since it was easy to do. I was overjoyed at how well my first batch of green ketchup turned out. Green Tomato Ketchup is very sweet and mild, almost like an apple sauce rather than a red tomato ketchup. I’ve tried it everything from eggs to fish sticks to sweet potato fries. Terrific! For food safety, it’s very important that you add bottled lemon juice to this Green Tomato Ketchup recipe to give it enough acidity to avoid any issues with Clostridium botulinum bacteria, which is a deadly neurotoxin. You can read about it on this PDF from the University of Wisconsin. They recommend 2 tablespoons of bottled lemon juice per quart. Since my Green Tomato Ketchup recipe makes 2 quarts, I added 4 tablespoons. Due to my food sensitivities to honey, I used agave nectar to sweeten my Green Tomato Ketchup recipe. Feel free to use honey if you like. If you’re new to canning tomatoes, here are some books to help you get started! Ball Complete Book of Canning and Preserving – I have this one and it’s perfect for beginners! You can download USDA Publications on home canning at the National Center for Home Food Preservation. Don’t have any canning equipment? The Ball Enamel Water Bath Canner comes with a 21-quart capacity enamel waterbath canner, chrome plated rack and Ball Utensil Set. Already have a large stock pot? Then you might want to purchase just the Ball Utensil Set and the Ball Home Canning Discovery Kit, which comes with a polypropylene rack and lifter, some jars, and a recipe book. I have this lifter and it works great! I also recommend Ball Dissolvable Labels. These are terrific for canned green ketchup as well as labeling jars for gifts like homemade taco seasoning or brown sugar scrub. Super easy to get off during washing. Finally, don’t forget to buy a case of 8-ounce Ball Jar Crystal Jelly Jars with Lids and Bands. If you’re making Green Tomato Ketchup as a homemade gift, the 4-Ounce Ball Jar Crystal Jelly Jars are ideal. Slice green tomatoes and onions. Place in a large pot with pepper, mustard, and Worcestershire sauce. Put the mixed pickling spices in a small cheesecloth bag and add to the tomato mixture. Cook for four to six hours over very low heat, stirring occasionally. Remove bag of pickling spices. Puree mixture with a wand blender or in a food processor or blender. Strain tomato mixture through a mesh strainer. Return to pot and bring to boil. Add lemon juice and 3/4 cup of agave and stir until dissolved. Using a clean spoon, take a taste. If you feel the ketchup is sweet enough, stop. If not, add another 1/4 cup of agave nectar. Remember to use a clean spoon every time you taste test. Immediately fill six sterilized jelly jars with green tomato ketchup, leaving 1/4-inch head space. Wipe the jar tops and threads clean with a clean paper towel. Place hot sealing lids on the jars and apply the screw on rings loosely. Process in boiling water bath in a deep canning pot for 5 minutes, adjusting for altitude. Remove the jars and cool completely. Tighten the jar screw rings to complete the sealing process. After the jars of green tomato ketchup cool, check seals by pressing middle of lid with finger. If lid springs back, your green tomato ketchup didn’t seal and must be refrigerated. Let jars of green tomato ketchup stand at room temperature 24 hours. Don’t forget to apply a dated label! Store unopened product in a cool dry place up to one year. Refrigerate green tomato ketchup after opening. Originally posted October 27, 2011. Updated with new photos. Posted in Gluten Free, Recipes, Veggies and tagged canning on August 9, 2016 by Anne-Marie Nichols. Sorry this didn’t work out for you. The batch I made turned out very well – nice and sweet and not too vinegary. It’s based on a recipe that uses the same amount of vinegar, so I’m not sure why you had this problem. Also, the directions mention using a mesh strainer. It’s always a good idea to read through directions to make sure you have all the equipment you need before starting a recipe. I made this true to the recipe. It tasted so terrible that I did not even can it. It needs much more sweetener then this recipe recommends but I did not even bother, as the taste of the apple cider vinegar is so potent that you cannot taste anything else. I am not someone who prefers very sweetened condiments but a ketchup is expected to be sweet. I think regular vinegar would be less overwhelming. Oh well. It was a green tomato experiment. Sorry this didn’t work out for you Lorry. It’s been a while since I made it and I remember it being very sweet. It’s a combination of spices used in pickling. You can buy it where canning supplies are sold. You can also find recipes for making your own homemade pickling spices online. My turned out just liquid is this right? I thought it would be thicker, I strained it through a mesh and all the pulp was taken out just leaving liquid?? Straining it through too fine a mesh will take out all the pulp, which will make it just a watery liquid. in the directions … # 7 does say to strain ?? I have not yet made the green ketchup because it seems to me that straining will create a liquid?? Make sure your mesh strainer isn’t too fine. You want to push it through with the back of a spoon to remove the skin and seeds but not the pulp. Straining it through too fine a mesh will take out all the pulp, which will make it just a watery liquid. If you want, you can skip this step and put the liquid in a blender and blend it to pulverize the skin, seeds, and pulp so it’s a nice thick liquid. Yes, it’s apple cider vinegar. I’m sure sugar is fine, but I don’t know if you would use more or less. You’d have to guess. what can I use instead of Worchestershire Sauce? I just left it out, added some salt, and it tasted great! Great idea for all those tomatoes that hadn’t ripened yet before the snow came. We picked them, but I wasn’t sure what I’d do with them. Thanks!